Love for Young Souls / Claz Coms: "Halloween" - introducing belief in the secular world? "Halloween" - introducing belief in the secular world? "Our Father, who art in heaven, HALLOWED be thy name". Yup. Hallowed. 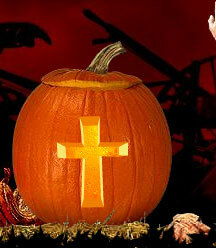 Sounds close enough to the word "halloween" to take this freaky celebration as linked, in some way, to Christianity. So what's this halloween stuff all about? Like, REALLY all about? And why do I have an issue with it (enough to write a blogpost about it)? In the YouCat, #519 teaches that to "hallow" or to "treat God's name as something holy means to place him above everything else". It then goes on to say that "to hallow God's name means to do justice to his reality, to acknowledge him, to praise him, to give him due honour, and to live according to his commandments. I dunno about you, but I rarely see God's name, his army of angels and saints, or the Church that Our Lord Jesus Christ died for, acknowledged or honoured during this 'night of fright'. In fact... quite the opposite. On the streets tonight, we'll see groups of children and teenagers glorifying the devil, demons and witches in their apparel - and it's not the worst of it that they're most likely oblivious to doing this. The worst of it, is that halloween has become such a joke, that people tend to think demons and witches, and the devil himself is a joke. I would really like for everyone to meet an exorcist, to discover how much of a joke demons ARE NOT! So I stress my point: it's probably not so much that children & teens are allowed to go around wearing devil costumes and freaking each other out with ghoulish 'tricks' or the yuckiest 'treats' that can be bought out of Poundland. The idea of dressing up, or eating sweets and chocolate, is a pretty fun thing - and it's good to encourage this in moderation. But they need to be educated on what exactly they are representing when they do this at halloween, and the reality of it. I watched this freaky movie the other night, called The Skeleton Key with Kate Hudson - really well made movie about a young and upcoming nurse, who goes into a home to care for an elderly man. However, there has been a history of voodoo in that place, and the 'wife' of the elderly mute is a spirit who has lived hundreds of years, transferring from body to body, and this young nurse is her next victim. When this spirit has gotten into the body of the nurse, [thus getting to my point], she says this: "It gets harder every time. They just don't believe like they used to. Gotta get 'em all riled up." When you lose faith, or belief, then your vision of the bigger picture of life becomes narrower. Consider your eyesight. You can see objects or people nearly 180 degrees around the front of your peripheral. Having faith in God is pretty similar to that, in that the spectrum of belief is wide - one tends to believe in the devil, his demons and bad angels, and voodoo, and witchcraft. Of course... these are all things of the spiritual world that very few of us are well connected to. When you don't believe, that spectrum is narrowed - your eyesight is then only what you can see right in front of you. One could argue that you've gotta dangle the bait in front of the preys eyes before the prey can act... is that what halloween is about then? Could the purpose of halloween be a good thing in the end? Could it help children and teens understand the reality of evil? I believe in the way we do it today, no. Like I mentioned, it's become a joke - a mockery. And mockery is neither good, true, real nor kind. And a second 'no' because if parents and teachers don't educate the kids on this stuff, then the message or the reality of evil is lost. When I look at the fake blood on people's faces, I think and reflect on the real blood of the Christ mocked after His scourging during His Passion. Not much has changed, right? I know of an awesome Catholic family, so God-fearing, and beautiful witnesses to the faith (the father was one of my lecturers @ SPES), who actually go around with candles on trick or treat night dressed as angels, and granting the peace of Christ to anyone who opens the doors. I mean... imagine if all Christian families did that on "trick-or-treat"night. Wow... there'd be competition with it becoming a "peace night" on certain streets of the States! As for me, I plan to give little bags of sweets out, but will include a little slip calling the child/teen to holiness, and a miraculous medal. And I'll be surprised if my front door doesn't get egged tonight! Anyways, in ancient Catholic tradition, we celebrated the feast of All Saints (all God's holy people who have left this world) as "All Hallows" on the 1st November. That would... errr... be tomorrow. Today is thus, in ancient terms, "All Hallows Eve" which is where the term "Halloween" comes from. It is meant to be (and if you pray the Divine Office, you'll see), a great celebration of holiness. A "holyween"! So as my conclusion, my issue with people celebrating halloween is that, like Christmas, people have COMPLETELY MISSED THE POINT!! 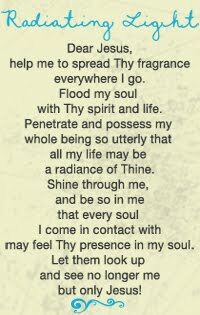 If you don't truly believe in God and his army of HOLY angels and saints, then you don't truly believe in the devil, and his army of demons and invokers. My advice: go and read up about it, and then see what your heart is thirsty for. Please God that won't be the fake blood of vampires but the Eucharistic Blood of Christ upon the altar of the Church.